The ECFA has purged their web-site of Mark Driscoll, but still certifies the integrity of Mars Hill Church. | Musings from under the bus. The ECFA has purged their web-site of Mark Driscoll, but still certifies the integrity of Mars Hill Church. The Evangelical Council for Financial Accountability is still giving its stamp of approval to Mars Hill Church. They correctly show the lead pastor as being Dave Bruskas. Mark Driscoll has been purged from the ECFA website. There is not a single reference to him. Nothing. Until recently Driscoll was highly featured in their advertising. An attempt to go to the WayBack Machine to see when the change occurred was blocked. It appears that the ECFA uses robot.txt to block its history to the public. So some time recently, Mark Driscoll was purged in a similar way to the way that Mars Hill Church would purge any reference about or sermons and writings of departing (and sometimes shunned) pastors such as Lief Moi and Mike Gunn, both co-founders of Mars Hill Church. But despite the decision to purge Mark Driscoll from its website and advertising, and despite the reality that former Mars Hill board member Paul Tripp has called Mars Hill Church “the most abusive and coercive church” he has ever worked with, and despite the numerous financial scandals, the ECFA continues to certify Mars Hill Church’s adherence to transparency, integrity, and accountability. One might ask why a church would need the ECFA certification, an entity that we now know bases their certification of a church on seemingly little information plus a few statements from the staff of that church. Surely, if a church was doing a good job being transparent with its donors, the ECFA certification might seem rather unnecessary. We now know that it is somewhat meaningless, or, perish the thought, even an indication that the church the ECFA certifies needs the certification in order to overcome its lack of transparency. So that when a donor asks questions, rather than be transparent, the church can merely point to their ECFA certification. This was how Mars Hill Church leadership has repeatedly used the certification. The ECFA itself has been very non-transparent and slow to communicate with the public about its removal of Mark Driscoll and its continued certification of Mars Hill Church. This despite the church collapsing in a stunning and spectacular way largely due to financial pressure. They have been so slow that one has to ask whether the ECFA was trying to protect Mars Hill Church and not the donors to Mars Hill Church? 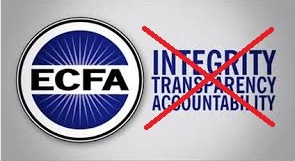 When one sees that the ECFA certifies other churches with similar financial non-transparency, like Stephen Furtick’s Elevation Church in Charlotte, North Carolina, and James MacDonald’s Harvest Bible Chapel, one has to wonder what sort of transparency the ECFA is certifying. Both of these churches have been added in the last 14 months, and both have had significant financial scandals prior to their certification where lack of transparency was a factor in the scandal. Mars Hill Church members, former members, and donors are crying out for financial transparency. Mars Hill Church leadership continues to ignore them, while the ECFA continues to certify the church. It would appear that the ECFA itself has lost its integrity. What was once a badge of excellence appears to have become a part of the problematic “Evangelical Industrial Complex” that we Evangelicals are now contending with. Rather than the ECFA certification leading to a donor feeling confident about an organization, it now seems that the certification will cause a donor to doubt and wonder. Hey Dan, Pastors and elders and you are not exampt from Mark 9:42…Stop the scare tactics.